My uncle is a physicist, and did some pioneering work in the field of thermal camera photo-receptors. 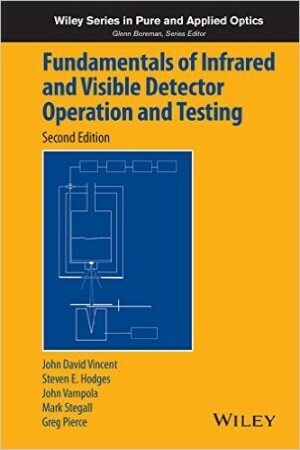 He even wrote a book about the field in the 90’s, Fundamentals of Infrared and Visible Detector Operation and Testing (1990, James David Vincent). The publisher wanted an updated manuscript for a second edition of the book. He’s been working on that for the past couple of years, but ran into a problem. He needed a diagram of a microbolometer. A microbolometer is a small sensor that is sensitive to infrared radiation. The radiation hits a sensitive material that then heats up, and its resistive value changes. By measuring the resistive change, a temperature can be determined. Thermal cameras, such as FLIR cameras, use an array of microbolometers to generate a thermal image. Although diagrams exist, the most well known (and oft plagiarized) is in fact under copyright, and not available to be republished without authorization. He asked me to create a new diagram that would convey the same information but be visually distinguishable from the other well-known image. After some back and forth, this is the image we came up with. It had to be black and white for printing, and easily readable. He also wanted extraneous information removed, so that there were fewer parts of the image to focus on. For example, the thicknesses and dimensions, though accurate, are not labeled. 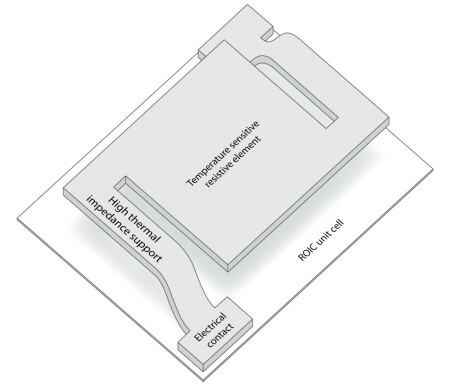 To facilitate not having a labeled dimension between the ROIC and the temperature sensitive resistive element, there is a visible shadow. The image was created in Illustrator, and sent to the publisher as an EPS file. The book, Fundamentals of Infrared and Visible Detector Operation and Testing second Edition (2015, John David Vincent, Steve Hodges, John Vampola, Mark Stegall, Greg Pierce), has been published, and you can see my diagram on page 94, Figure 3.3. This entry was posted on Friday, February 26th, 2016 at 2:45 pm	and is filed under Design. You can follow any responses to this entry through the RSS 2.0 feed. You can leave a response, or trackback from your own site.